Every musician remembers the bands and artists that lit their fire, igniting the spark for their love of music. It’s a love like no other, one that molds a lifestyle, fuels a dream and takes you on a journey. No matter who you are or what kind of music it was, it changed your life. To many Warrant is one of those bands. They came from an era of music that exuded fun, flash and excitement with loud guitars and catchy hooks. Their music videos could be seen all over MTV, their picture in every magazine. For the generation of musicians that grew up rocking out to Warrant that’s how it all began! The band is nearing the 30th anniversary of their debut album “Dirty Rotten Filthy Stinking Rich.” With hits like “Heaven” and “Down Boys” the record went multi platinum and earned them their first big tour playing over 260 shows with Motley Crue. I recently caught up with co-founding member and guitar player Erik Turner and asked him what he remembers most about the making of their first record. “I was really green, other than recording a few demos prior to that, I didn’t know anything, we just did what the producer said and knocked the whole thing out in about six weeks which is pretty quick,” Turner said. He recalls the band getting together to watch the premiere of their music video and shopping on Melrose Avenue in LA when he first heard their music playing on the radio from a car passing by. Achieving that kind of success and longevity in the music industry doesn’t happen for a lot of artists though, especially with how often things change and evolve. “We’ve seen the production of music go from vinyl to cassettes to cd’s to digital to streaming, it’s great for the consumer but not for the artist, music has been devalued,” Turner said. Long gone are the days of fans running out to buy their favorite artist’s album, tearing off the wrapping, opening up the packaging and spending hours upon hours looking at the pictures, reading the lyrics and getting to know the band all while listening to the whole thing over and over again. Now, one can simply get all that with a quick visit to the internet. For all the ups and downs and the frequent changes, one aspect of the music industry that Turner says is alive and well is playing live! Thanks can also be in part to social media,. 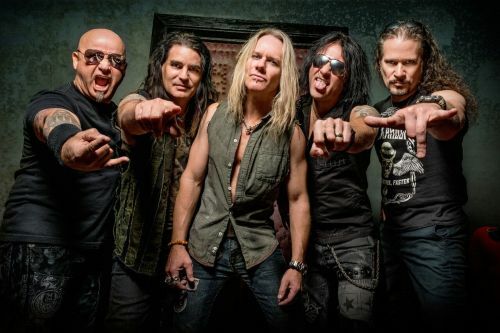 With all that Warrant has achieved since bursting onto the scene nearly three decades ago, Erik still has hopes that the band can someday tour with the likes of AC / DC and Def Leppard. Greatest hits compilations and live albums aside, their catalog includes 8 studio albums full of music, like it or not he knows that their legacy will always be “Cherry Pie.” It doesn’t matter what state the industry is in, music is alive and well with the next big band or artist always just right around the corner.